Another gap of about 20 minutes provides another opportunity to enjoy the slow cast of rain, the smoke from the fire, while standing under the outside awning. One of my tablemates, Marty, is overly happy to join in when he hears Fosco Amoroso speaking to Cretarola about the farrotto n’ndocca n’docca. He and his wife Sue and another couple came on the recommendation of a friend, a personal chef from New Jersey who has been to the restaurant more than a dozen times. When Amoroso confesses he is well past feeling every bite, I mention how I’m doing more than just clearing every one of my own dishes. “You’re the man,” he says, when Marty informs him of how both him and his wife had handed over nearly untouched courses of taccozzelle and gnocchi, respectively. The intermezzo ensues with a chilled glass holding a delicate, thawing granita. There’s a soothing coolness and a lemon tartness heightened by thin strips of basil. The olive oil is a touch of genius, adding a cask of sunshine, while the pepper infused within it adds further complexity without raising its voice as it prevents the lemons from doing the same. And like that, all my taste buds are back online, ready to go. Which is good, because we’re arguably at the heftiest portion of the menu: 5 courses of roasted or broiled meat. They’re well matched by the Rubesto Montepulciano, which brings enough flavor to complement even the gamiest of offerings, owing to an increased maceration time (20 days) which exacts more tannic and fruit elements from the grapes. Levitas says that during this step, the hand-selected grapes are kept cold enough so fermentation doesn’t occur. The wine’s deep flavor also comes from being aged in French oak—which adds hints of vanilla and spice as low levels of oxidation help soften tannins—as well as in the bottle. First up, is the rabbit, which is enlivened by being prepared “in porchetta”, or in the style of the pig—that is, it’s also given the same rub of salt, pepper, red pepper flakes, and a rosemary pesto as its porcine counterpart. The duck is a beautiful slab of flesh, the pink/reddish hue exclamatory as the plate drops and an exhale sends tannins running up my nose from another sip of the Rubesto. Sweet and fatty is amplified as the wine adds to the mouth feel, the experience to be repeated with the following course: a beautifully burnished suckling pig wheeled out not just to awe, but outright incredulity. As with the rabbit, the wine’s floral notes and tempered acidity pull out hints of pesto, while complementing that porky sweetness. The skins bowls me over: a crisp jai alai basket, I could picture myself using it to scoop up potato salad at a beer hall in Munich. 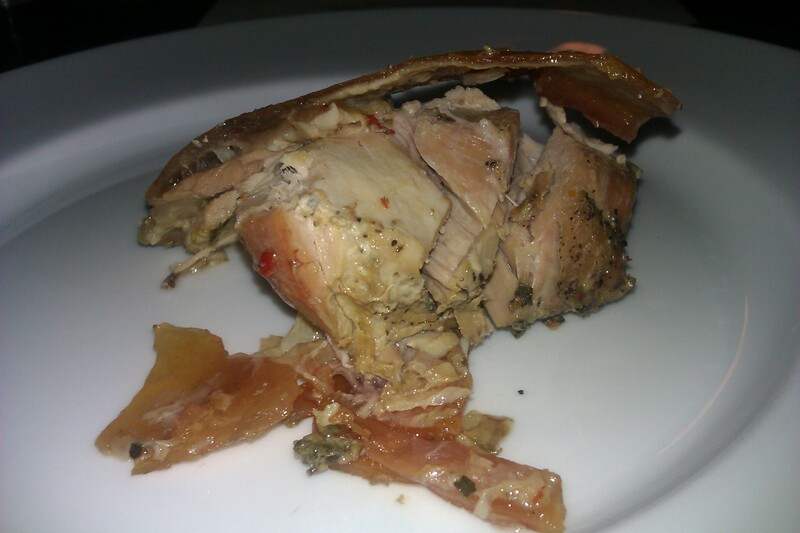 Porchetta given a crisp carapace. Just like the duck, the steak is served as it always should be: a pinkish red country given outline by pan searing, a generous coating of seasoning, along with of proper band of fat. With the final cut, the roasted lamb, the Robesto excels even further as it stands up to and magnifies gamey, fatty, and herbal flavors (fresh rosemary), each bit of fat making it seem more robust as tannins and floral elements crash on my tastebuds.